A slow-burning sniper stand-off, The Wall aims to distill a nasty war into a personal traumatic ordeal, but falls short of its target. Iraq, 2007. The US military involvement is supposed to be winding down, and reconstruction efforts have begun. 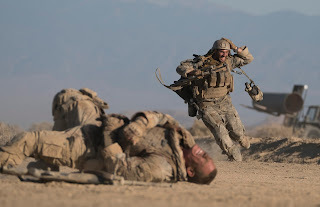 Sergeant Allen Isaac (Aaron Taylor-Johnson) is the spotter for Staff Sergeant Shane Matthews (John Cena), a sniper. The duo have been called to investigate multiple killings at a remote contractor's job site in the desert. A pipeline is under construction, but all the workers and their security contractors have been killed by an unseen sniper. After observing from a hilltop for a long period and not spotting any enemies, Matthews goes down to the site to investigate and is promptly shot. Isaac attempts to rescue his colleague, but is also shot and wounded. Taking cover behind a rickety wall, Isaac is surprised to receive radio contact from Juba (voice of Laith Nakli), an Iraqi sniper who embarks on a campaign of taunts and psychological warfare with unforeseen outcomes. An Amazon Studios production directed by Doug Liman, The Wall is essentially a one-person, one-setting drama delving into the unseen, lonely agony of a soldier fighting in a foreign land. Written by Dwain Worrell and running a taut 81 minutes, the film nevertheless is stretched for content, and rarely achieves the required intensity level. Reminiscent of Buried and 127 Hours, The Wall zooms in to the level of one individual alone and placed at a huge disadvantage in a hostile environment. To gain momentum such films require the protagonist to undergo a mindspace journey, and The Wall never quite finds the right path for Isaac to follow. There is a gradual reveal about an incident in Isaac's past that haunts his psyche the way Juba pins down his present, but Liman hardboils both the soldiers anguish at his past actions and his frustrations with his current plight. What remains are plenty of tactical back-and-forth moves across a wall fragile enough that it barely deserves the name, as Isaac tries to spot the location of his foe and extricate himself out of the line of fire. Within the limitations of the material, Liman and his cinematographer Roman Vasyanov do a fine job building up the visual tension and staying up close and personal. As the opponents communicate, some traction is gained in questioning the US involvement in the war, but to the detriment of the film the never-seen Juba emerges as the more interesting character, designing his own war in a country gone to hell. The Wall contains bricks of interest, but spends too much time on the wrong side of the structure.